The left heart sends the oxygenated blood to the various tissues of the body through the aorta artery (main artery distribution) and the smaller arteries. Once used by the tissues, the oxygen-depleted blood back to the right heart, first by small veins, then the veins caves (major veins) that serve as the collector. It is then sent to the lungs. Once oxygenated in the lungs, blood returns to the left heart for distribution throughout the body. Thus, the loop is closed. 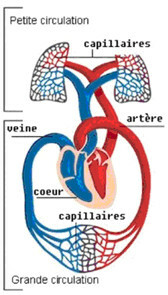 This is the pulmonary circulation. It includes the right heart (atrium and right ventricle), pulmonary artery, lungs and pulmonary veins. It allows blood to refill oxygen. Heart failure is a condition in which the heart is no longer able to perform its pumping work properly to cover the energy needs by the body. Cardiac output (the quantity of blood ejected per minute by the heart) no longer allows the body to function normally. If the deficiency relates to both the previous two mechanisms, there is talk of a systolic and diastolic dysfunction. At the beginning, heart failure does only little symptoms or sometimes there is no symptoms. The heart find in itself the resources to cope with the increased workload imposed on it. It adapts by becoming thicker (hypertrophy) is the compensated stage. But little by little, this adaptation becomes inadequate and reaches its limits. The heart expands, becomes less and less capable to ensure the needs of the organism and the clinical manifestations appear. Worse yet, the compensation mechanisms put in place by the body will be deleterious for the heart. left heart failure or left ventricular failure when failure reached the left ventricle. right heart failure or right ventricular failure when the failure reaches the right ventricle. The blood no longer escape to the stagnant bodies in the vessels of the lungs. Clinical signs are mainly respiratory. The first stage consists of dyspnea (shortness of breath) when performing efforts. Dyspnea occurs then with varying degrees of effort less and less important to appear even at rest. At the final stage, the patient is always short of breath, a cough with bloody sputum, can no longer sleep lying down and breathing better when sitting. Although these symptoms usually develop gradually, the trend may be more brutal in some cases: these are the episodes of hemodynamic pulmonary edema in which the patient literally drowns in the liquid transudation resulting from congestion of blood in blood vessels of the lungs. It is said that currently the patient has "water in the lungs". The main symptoms are fatigue and taking undue weight. Echocardiography to evaluate cardiac functional capacity of the ventricles (cardiac function). The continuous recording (Holter) can search for cardiac arrhythmias. Other tests may be performed in hospitals: examinations hemodynamic (cardiac catheterization), biological, histological, bacteriological, parasitic, immunological, etc. The causes are multiple. All conditions that weaken the heart muscle, which interfere with blood circulation, or that require the heart to work faster or stronger (anemia, hyperthyroidism, arterio-venous shunt) can lead to heart failure. Myocardial infarction: part of the heart muscle is destroyed. The heart has less force to shrink. High blood pressure: the increase in blood pressure causes thickening of the muscular walls of the left ventricle. This thickening restricts the free movements of heart and makes it more rigid. It can not contract or relax effectively. Cardiac arrhythmias: the heart muscle contractions are more effective because they are either too fast or too slow or out of sync. Insufficiency of the aortic valve: the aortic valve is no longer able to close and blood reflux into the left ventricle during diastole. Accordingly, the amount of blood sent to the organs and tissues is less. Narrowing (stenosis) of the aortic valve or the pulmonary valve: it causes an obstruction to the passage of blood through the valves at the corresponding contraction of the ventricles. 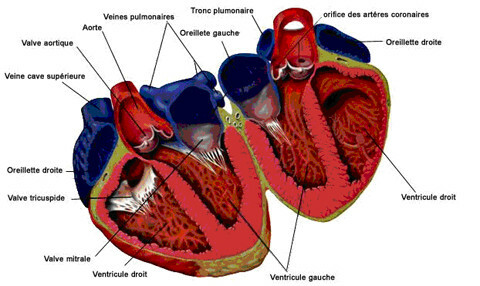 Insufficiency of the mitral valve or tricuspid valve: blood flowed toward the atria when the ventricles contract. As a result, the amount of blood sent to the organs or the lungs is less. Narrowing (stenosis) of the mitral valve and tricuspid valve: it causes an obstruction to the passage of blood through the valves at the corresponding filling of the ventricles during diastole. The blood stagnates and leads upstream congestion atria. Infections of the heart muscle or heart valves: myocarditis, endocarditis. Toxic cardiomyopathy: alcoholic cardiomyopathy, cardiomyopathy post-chemotherapy. Heart defects: inter-ventricular and inter-atria communication, obstructive cardiomyopathy. Lung: pulmonary embolism, chronic pulmonary insufficiency, pulmonary infections, pulmonary fibrosis. It is based on an assessment prepared by the functional NYHA (New York Heart Association) in the USA . The criteria for the classification is used to evaluate the importance of the functional impact of the disease, to determine the type of treatment to administer to patients with heart failure. This sheet shows the different classes of heart failure at the direction of the NYHA. Classe I No limitation of physical activity. Habitual physical activity does not create excessive fatigue, dyspnea or anginal pain. Classe II Moderate limitation of physical activity. No symptoms at rest, but usual physical activity causes fatigue, dyspnea or anginal pain. Classe III Marked limitation of physical activity. No symptoms at rest but physical activity lower than normal (light effort) causes fatigue, dyspnea or anginal pain. Classe IV Unable to perform any physical activity without discomfort. Symptoms of heart failure or angina occur sometimes even at rest. The discomfort is increased by any physical activity. The evolution and prognosis depend on the disease responsible for the heart failure. Dietary guidelines: They are used to remove all factors that can adversely affect heart failure: tobacco aggravates pulmonary signs, excessive alcohol consumption, obesity which is in itself an overload for the heart. Restriction of salt: This is an important element as the ingested salt contributes to the retention of fluid. It is recommended the cardiac patient to weigh every day because any abnormal weight gain will require an adjustment of medical treatment by the treating physician. Rest: It is indicated in acute heart failure. In some cases (acute myocardial infarction), the strict bed rest may be indicated for optimal treatment. Inhibitors of angiotensin converting enzyme 2 (ACE) . They have a dual action, vascular and neuro-hormonal. They dilate both the arteries and veins without altering cardiac output. They correct a number of hormonal abnormalities that contribute to the occurrence and persistence of heart failure. Antagonist of receiver of angiotensin 2 (AT2) are part of the treatment of heart failure and can be administered to patients with side effects caused by the ACE inhibitors. Beta-blockers: they slow the heart and correct some disorders of the nervous system (the sympathetic nervous system) that maintain and exacerbate heart failure. Digoxin can be administered to improve the patient's symptoms. Amiodarone (Cordarone) may be administered in case of disturbance of heart rhythm (atrial fibrillation). Pleural puncture or puncture of ascites (evacuation of serous effusions in hospital) can improve symptoms of patients. The automatic implantable defibrillator, electro-systolic heart training , heart transplant and artificial heart is the ultimate treatment methods. Physical activity: Patients with stable heart failure should have a physical activity and training adapted to the effort (cardiac rehabilitation) to improve their tolerance to effort and quality of life. Pregnancy: Pregnancy is unlikely to be completed in patients with heart failure class III or IV, because of the high risk of morbidity and mortality. Heart failure is a serious disease, often with debilitating and life-threatening risk. Patients who are not treated effectively face a higher risk of death. To increase their chances of survival, people with heart failure should keep strictly to the dietary guidelines and therapeutic established by their physician.